There are many fine courses and clubs in the Chicago area, but it's still nice to see a facility with the history and architecture of Beverly Country Club's caliber welcoming the golf-loving former president of the United States to its roster. Teddy Greenstein reports for the Chicago Tribune. Members refer to Beverly Country Club as “the United Nations” of golf clubs, a home to people of all ethnicities, races, faiths, political parties — and both sexes. The membership includes multiple Nobel Prize recipients and politicians such as Illinois House Speaker Michael Madigan and Ald. Ed Burke. The club features a Ron Pritchard restoration of a Donald Ross original. Purported to be in the Monterey Peninsula for the AT&T Leadership Conference coinciding with the AT&T Pebble Beach Pro-Am, former president Barack Obama brought the sticks along. Just in case the Cypress Point invite comes. Or? Could he be a last minute pro-am fill-in? Stephen Ellison reports for the Bay Area's NBC affiliate. Nice to see Barack Obama getting some lessons from a Harmon, in this case Claude. Nice to hear everyone, from the Harmons on down to the former President, apparently seeing a different Tiger than a few years ago. And nice to see The Floridian enjoying such a resurgence under owner Jim Crane. Golf Channel insider Tim Rosaforte reported on Morning Drive today about Tiger Woods’ recent round there alongside President Obama, who played another day there with Michael Jordan. Take your politics and stick 'em in a drawer, as the plan unveiling for a Tiger Woods design at President Barack Obama's presidential library complex has been met with the kind of architectural scrutiny and perspective you'd hope for in a public project. The effort is of note given the role of the Olmsted Brothers in this area and their influence on Woods' lead designer, Beau Welling. The Chicago Tribune's Blair Kamin looks at the proposal from a landscape architecture perspective and questions elements of the merging of two courses. He isn't thrilled from the Olmsted perspective in part because Tiger architect Welling has not yet been in communication with the folks developing the park aspect. But the planning process for that park, which took on new layers of complexity Wednesday with the unveiling of a design for a $30 million Tiger Woods golf course in the park's southern end, almost surely would have given Olmsted pause. He believed that all elements of a park should be subordinated to a greater whole. That's what the designers in charge of a Chicago Park District push to draft a new plan for Jackson Park said at a public meeting Wednesday. Yet such an all-encompassing vision is not yet evident. Latent conflicts between different priorities for the park have not been brought to the surface and thrashed out. The designers of the golf course have yet to talk to the designer of the landscape that will surround the planned Obama Presidential Center. The lack of coordination threatens the promise that the center and golf course will endow Chicago's south lakefront with a park equivalent in quality to Millennium Park or Lincoln Park. For decades, the south shoreline trailed its North Side counterpart in everything from acreage to amenities, a result of racially discriminatory under-investment by the Park District. A 1999 plan for the south lakefront has helped alter that separate-but-unequal reality. In recent years, the city has poured millions of dollars into Burnham Park south of McCormick Place, including a new harbor and playground at 31st Street as well as a new pedestrian bridge at 35th Street. From a golf point of view, Teddy Greenstein outlines the positives he sees (10!) and sees plenty to like. CNN's Kate Bennett reports that former President Barack Obama has opted to take the presidential comp membership of Robert Trent Jones Golf Club over Woodmont Country Club. You may recall some members at Woodmont reportedly protesting the prospect of an Obama membership. Robert Trent Jones Golf Club, however, is an upscale, golf-only, private club, with a par-72 course on the shores of Lake Manassas. One member, speaking on condition of anonymity, says annual membership fees and dues total about $15,000, though another source indicated every former president has an honorary membership, and fees are waived. I’m non-partisan when it comes to U.S. Presidents playing golf and using the golf course to make deals, take in fresh air, or, most importantly, suffer ego slap downs from the Golf Gods. Still, it’s fascinating to see that President Donald Trump’s many early forays into golf are seen as as less prevalent than Barack Obama’s. Allan Smith reports for Business Insider that 53% of Trump voters said Obama outpaced the current president with trips to the links. A Thursday poll from the Democratic firm Public Policy Polling shows that 53% of respondents who said they voted for Trump in November said Obama had outpaced Trump on trips to the golf course during each president's first three months in office. Just 20% of Trump voters said Trump played more golf, while 27% said they were unsure. Among all respondents, 48% said Trump played more golf, while 28% said Obama did. Nearly one in four respondents said they were unsure. Spicer On Trump's Golf: "He is ‘entitled to a bit of privacy'"
President Donald Trump's criticism of former president Barack Obama's Sunday golf rounds has been well-documented. So as the (now) sitting president hangs out at Trump International with regularity, his passion for the game has become of great interest to those who documented Obama's golf habit. Press secretary Sean Spicer says the president is entitled to his privacy and therefore should not be accountable for his affinity to tee it up on the record, reports Politico's Kelsey Sutton. Much was made of the New York Post story on President Barack Obama facing member-backlash should he try to join the mostly-Jewish Woodmont Country Club over his Israel policies, but a few readers who know the club wrote to say they were struggling to see such a widespread membership stance against the president. Thanks to reader Joe, who sent in this Washington Post story by Bill Turque suggesting hostilities may be the work of just a few members, while others sound more eager to welcome the soon-to-be-former president. Simon Atlas, a former chair of the club’s admissions committee, said he would be “honored” to have Obama as a member. He added that the club had never applied a political test for acceptance. Obama only intends to live in the Washington D.C. area for two years while his youngest daughter finishes high school. His love of the game figures to make his golf preferences in D.C., Chicago and elsewhere (greater Palm Springs?) of great interest. The White House life and post-presidency talk, and an entire portion of mulligan golf talk, were part of his final 60 Minutes interview with golfer Steve Kroft. It's a trivial question given what's at stake. But now that the world can focus again following another Bernhard Langer win in the Schwab Cup, the complex question of Donald Trump's presidency-to-be turns to the entirely inconsequential question of what having a president-elect golfer means. His direct ties to the game are more significant than any president before him, including Presidents Bush 41 and 43, whose ties to the Walker Cup were obviously strong. Yet having a family tie to an important amateur event pales given Trump's ownership of marquee properties hosting major tournaments. He told Lesley Stahl on 60 Minutes Sunday night that he doesn't care about his businesses compared to governing America, yet project-related conflicts will inevitably arise. Besides his curiosity with projects he was very closely involved in, matters will get inevitably awkward when trying to gauge his positions. The most obvious: his campaign position on climate change conflicting with his company stance regarding a changing shoreline at Doonbeg. With Trump's view that golf is aspirational, it's pretty safe to assume a WPA-style project to restore municipal courses won't be on the agenda to grow the game and salvage deteriorating properties. And given his criticism of Barack Obama using his time to play golf instead of helping Louisiana flood victims, we probably won't see him working the House and Senate on the golf course...oh wait, maybe we will. There is also the likelihood of his golf properties gaining prominence from presidential visits, as this Maggie Haberman/Ashley Parker NY Times story suggests he will be spending a great deal of time outside of Washington. Jaime Diaz of GolfDigest.com attempts to consider how Trump will perform "through the prism of golf" and besides reporting that golf has hardly been on his mind for a few months now, the ties will continue to be inescapable. Here is where things will get interesting: it's pretty well known that Presidents rarely turn into nicer, healthier or saner individuals after living in the White House. Golf has long been the primary go-to sport for presidents seeking rest, relaxation and camaraderie. Trump certainly has shown a love for the game and presumably will need days off. Will he play? The stakes for golf in that situation are significant for the sport, insignificant compared to most other presidential matters. Because if Trump continues to avoid using golf because the imagery plays poorly with the working-class voters who helped elect him, then sterotypes mentioned by Diaz are reinforced. Yet if Trump does use the golf course to socialize, relax or make deals, does that negatively reinforce the view of golf as merely an aspirational game for the rich and powerful? Golf probably can't win no matter what happens, but given the badgering the sport has taken in recent years, I'm not sure golfers will be affected either way. If you watched the Opening Ceremony of the 2016 Rio Games you know there was a short conversation with President Barack Obama about the Olympics. David Feherty's full chat is set to air on Golf Channel's Morning Drive from 7:30 to 9 am ET. No preview clip is available. 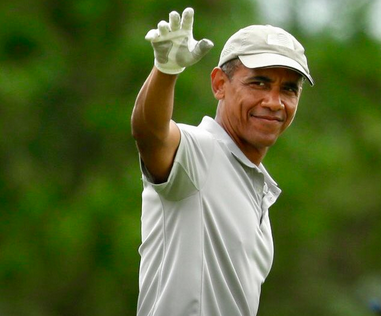 Among the purported topics: golf entering the Olympics and Obama's game. This latest "get" means Feherty has interviewed all of the living golfing presidents. In other Obama news, Kathy Bergen and Katherine Skiba report that the decision to bring his Presidential Library to the South Shore could help expedite the hoped-for renovation of Jackson Park. The long-shot vision to build an expansive 18-hole course worthy of a spot on the PGA Tour, which has been hovering on the radar, gained momentum last week with the announcement that Obama's library and museum would be built in historic Jackson Park, said Mark Rolfing, an NBC/Golf Channel analyst who is advising the Chicago Park District on the idea. **Clip on his love of the Olympics. And his take on the impact of the Games. Very diplomatic take on golf's return, a jab at the bland format would have been nicer. President Obama discusses the return of golf to the Olympics. Presidential Golf: Obama's Walk-Off, Trump's Numbers Low? As President Barack Obama drains a walk off chip at Mid-Pac Country Club, the LA Times reports on a Morning Consult study saying that the folks who actually answer their phone for pollsters may actually be downplaying their support for Donald Trump when asked. We may have another golfing president just yet! "It was reported today he played 250 rounds of golf and he's going to be in Hawaii, I think did they say for three weeks?" Trump said. "Two hundred and fifty rounds, that's more than a guy who plays in the PGA Tour plays. He played more golf last year than Tiger Woods. We don't have time for this. We have to work." I'm not sure what's of more concern: that President Obama tells Bill Simmons that watching the occasional chip-off from The Big Break is his treadmill guilty pleasure viewing, or that some poor aid is going to have to break the news that the show is on a hiatus of the permanent variety. From the Simmons GQ interview hitting newstands.